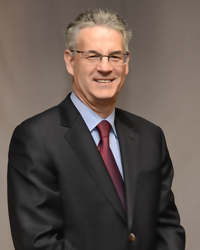 Charles Wax serves as CEO and Chairman of the Board for WAXIE Sanitary Supply. Charles began working at the family owned business as a 12-year old sweeping floors and stacking products in the warehouse. He worked after school, during the summer months, during winter vacations, and when extra help was needed. In 1972, Charles graduated with a BS degree in accounting from San Diego State University at 20 years old. After his graduation from college, Charles worked for a brief time at Crown Zellerbach in San Francisco. In March of 1973, Charles began his full-time career with WAXIE. Charles has worked various positions learning the business. He became President in 1986 and succeeded his father in leading the business when he passed in 1996. Charles has been very involved in the growth and development of WAXIE and has seen the company grow over 80 times its size since entering the business. Beginning in September of 2012, Charles moved into the role of CEO & Chairman of the Board. In this role, Charles will continue to oversee the strategic plan and ensure WAXIE’S legacy and continuity for years to come. Wax is involved in numerous community organizations. He served as Vice President of the San Diego Hall of Champions, a member of the Board of Directors of the United Jewish Federation, and a member of the International Sanitary Supply Association (ISSA). He is a former member of the Board of the San Diego Chamber of Commerce and served on the Executive Committee for San Diego Youth Tennis. He is a lifetime member of the San Diego Tennis Patrons and the Navy League. He was past Chairman of Network Services, a member-owned, Chicago-based, $6.7 billion distribution organization. Charles was the founding President of the San Diego Jewish Academy, and has served as the Vice President of Tifereth Israel Synagogue. He has co-chaired the Breitbard Golf Tournament twice. In November 2007, Charles was inducted as a member of the San Diego Business Hall of Fame. The family is very involved in many local and national charitable organizations, including WAXIE’s involvement as the Flagship Sponsor for the Making Strides Against Breast Cancer Walk.